installing the Facebook tracking pixel using tag manager. My colleague has also written a post on using Google Tag Manager with the LinkedIn pixel. All of these are very important, but arguably the most important thing is tracking goals within your Google Analytics account. After all, what’s the point in conducting any digital marketing activity, such as SEO, social media, or inbound marketing, if you can’t track the results? Google spends a lot of time working on their Analytics terminology. ‘Goals’ are defined as an action carried out by the user that fulfils a targeted objective on the website. Goals sit within the ‘Conversions’ tab in the left hand navigation panel. eCommerce – provides ecommerce tracking metrics such as product purchase information and transaction value. Multi-Channel Funnels – shows whether more than one channel (such as social media, PPC, direct traffic, etc.) contributed to a conversion. Attribution – compares different models in relation to how much a certain channel affected a conversion. Avinash Kaushik’s blog post is a highly informative read on this topic. The only other section within conversions that I haven’t mentioned is the focus of this post — Goals. Let’s first take a look at the different types of goals available. What types of goals are available? We should firstly make the distinction between macro and micro goals. Macro conversions tend to be lead generation or an actual purchase, for example an eCommerce transaction or the submission of information through a lead enquiry form. Duration – triggered when a user spends a certain amount of time on your website. Pages/Screens per session – occurs when a specific number of pages have been visited by a user. Event – a goal is recorded when a specific event occurs. Events could be a social share, a video play or a button click. Smart Goals – Smart Goals use machine learning to look at user behaviour on your site. 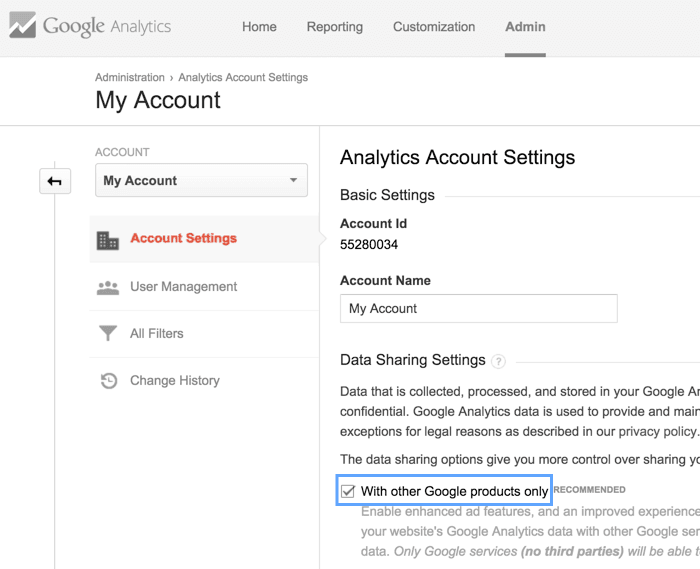 GA then determines whether that user’s session is valuable and likely to lead to a conversion. In truth, if you’re reading this tutorial then you’re probably beyond Smart Goals, so I wouldn’t recommend implementing them. Your website provides a service, and the average cost of this service is £500. If you know you convert one out of every 50 leads that come through your contact form, that’s a goal value on your form of £10 per conversion — the conversion in this case being a form fill. Your marketing activities must therefore cost less than £10 for every 50 leads in order to achieve profitability. That lead becomes a customer. Without Google Analytics, the top two cannot be tracked. Without goal tracking being implemented, the third step cannot be monitored. The fourth stage of the process requires integration to some form of customer relationship management (CRM) system so you can get a true understanding of ROI, but you can see how goals are the link between the website and the CRM system. To underline the point, you can also dive a bit deeper into the data depending on the goal you have set up. Destination goals enable you to create a funnel whereby you can analyse the information in the Goal Flow and Funnel reports. This allows you to add steps people would theoretically complete before converting so you can identify pages with potential issues by looking at more detailed metrics. Are people dropping off at a particular stage in the funnel? If so, this would suggest there is a problem that needs addressing. Without goals you have no insight as to what your website’s conversion rate is, why or where people drop off before converting, or which channels contribute to a conversion. This data is invaluable to marketers looking to improve their site’s performance (also known as conversion rate optimisation, or CRO). You can find out how to get the most out of Google Analytics (and Google Search Console) by viewing a recent talk of mine. How do I setup goals? To implement goal tracking, you first need to consider which of the five goal types are most appropriate. You then need to head over to the admin area within GA. You’ll need to create and edit goals for specific views, so select the view you want to add a goal to and click ‘Goals’. On the next screen (above), Click ‘+ NEW GOAL’ and select the most appropriate description for your goal. There’s quite a few options here, so if you’re not sure, just select ‘Custom’. You may also have the option of enabling the aforementioned Smart Goal. Smart Goals are a feature within Google Analytics that enable users to “optimise AdWords performance using your best website visits as conversions”. Click ‘Next Step’ after you have chosen your first option. You’ll then need to choose the name of your goal. Make sure it’s descriptive enough for you and your colleagues to understand the meaning. Once this has been completed, select ‘Next Step’ and move onto the goal configuration section. I’ll now walk you through each goal type’s setup. Destination is arguably the Google Analytics goal of choice. They are set up by using a fixed (or virtual) URL to signal a goal within GA. This usually occurs after a specific action has been completed, such as a contact form submission or newsletter subscription. You’ll need to specify the match type for the goal as ‘Equals to’, ‘Begins with’ or ‘Regular expression’ before defining the URL parameters. You can learn more about using regular expressions in Google’s guide, but in essence these options enable you to customise your goal to suit your URL. For example, if your URL uses dynamic parameters, you can use ‘Begins with’ or a ‘Regular expression’ to ensure your goal is recorded. In most cases however, ‘Equal to’ should be sufficient. 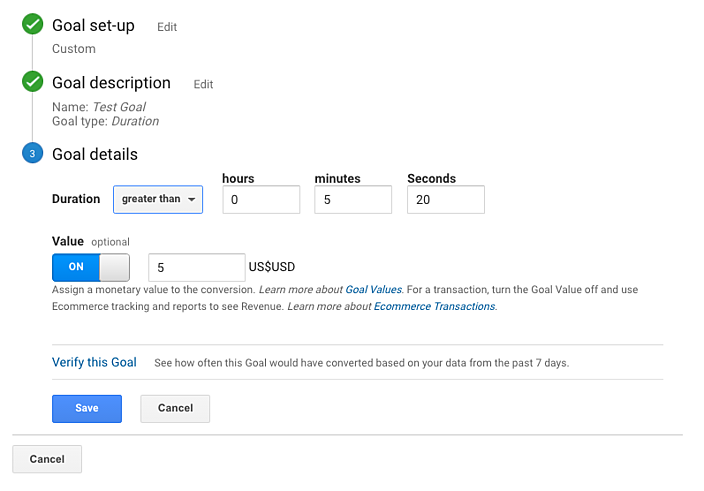 You then have the option to add a value and a funnel to the goal (you can change the currency in the view settings). 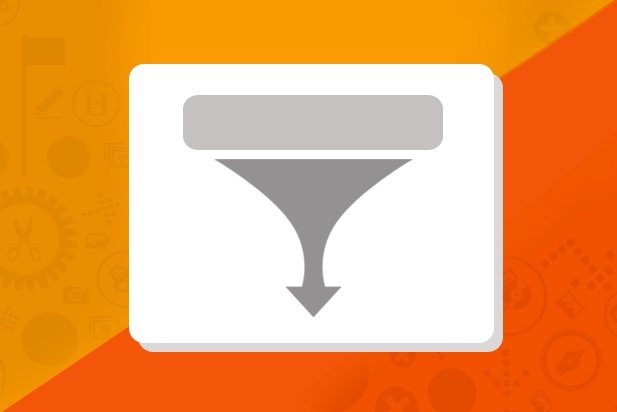 The funnel enables you to better understand where people are dropping off before converting, allowing you to appropriately optimise those parts of the funnel. For a really detailed guide on conversion funnels within GA, I’d recommend checking out this article on KISSmetrics. In my opinion, a duration goal is one of the least useful. It’s often misleading because time on page doesn’t necessarily indicate that a user has completed a certain action. What if they leave their computer for five minutes and then return? It’s a passive goal, so it doesn’t always provide much insight, but it does have its uses in certain situations, such as tracking whether people have stuck around long enough to watch a video (but with advancements in analytics tech for video platforms this is becoming increasingly redundant). The main advantage is how easy it is to set up. Just select the ‘Hours’, ‘Minutes’ and ‘Seconds’ of the goal and, if applicable, assign a value. That’s it! I’d recommend putting this goal in its own view, filtering out traffic to any page other than the page containing the goal you're trying to track. Again, this is not a hugely insightful goal, but it can be applied in certain situations. If someone has visited a certain number of pages on your site you could clarify this as a micro goal. In theory this could be an indicator that someone is very interested in your product(s) or service(s), potentially leading to a macro conversion in the future. The set up for this is again very simple. Just set the ‘Pages/screens per session’ and choose whether to add a value. This type of goal is extremely useful for tracking events that you have defined (or wish to define) as goals. Unfortunately, there is no way to add a funnel to this type of conversion, which is why destination is generally preferred. To set the goal up, you will need to define at least one of the ‘Category’, ‘Action’, ‘Label’ or ’Value’ for your event. It’s worth noting you don’t need all of them — just one will do — but if you select more than one those parameters they have to exactly match in order for the goal to be triggered. If you only select one (such as ‘Action’), only the action needs to match your definition in order for the goal to be fired. 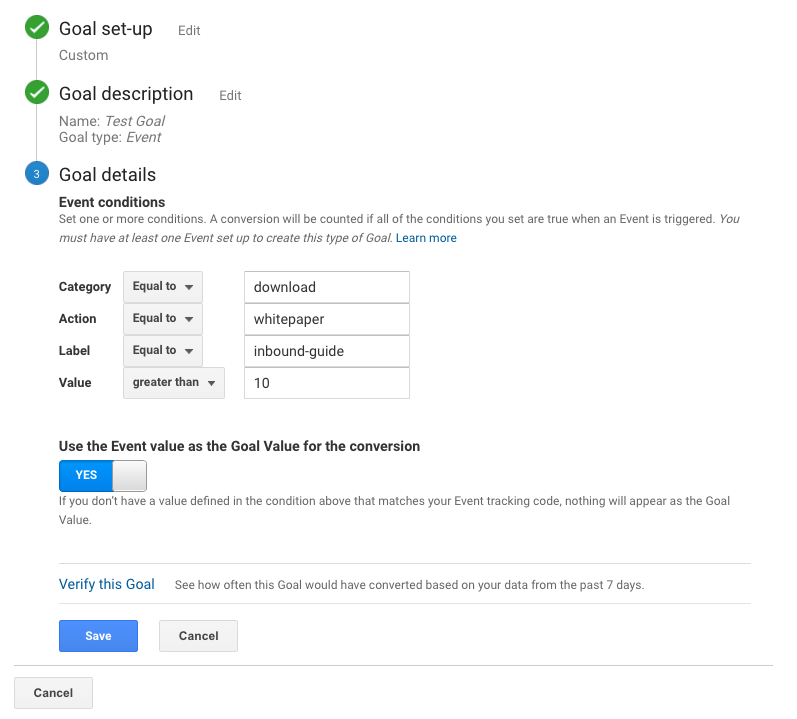 You can also select whether or not you’d like to choose the event value as the goal value. To do this, just select ‘Yes’. If you don’t wish to use the event value as the goal value, select ‘No’ and either enter your value or leave it blank. 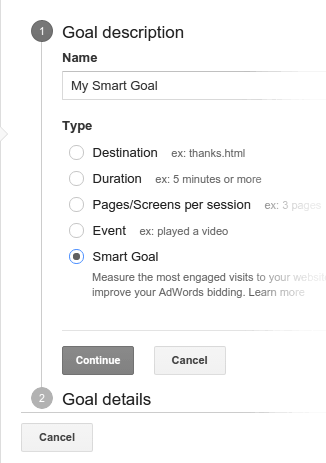 Smart Goals (not to be confused with SMART goals, the acronym for Specific, Measurable, Achievable, Relevant and Time-bound goals) were released to Google Analytics users at the end of 2015 and, as mentioned earlier, are designed to help AdWords users optimise their campaigns when they’re not otherwise tracking goals via AdWords, or importing them from GA.
Again, Smart Goals aren’t ideal because they use artificial learning and machine intelligence to examine your website’s visitor activity. GA then calculates which of those are most likely to result in a conversion. Every session or visit to your site is then given a score, with the ‘best’ visits being converted into Smart Goals. Once you have them enabled, the next step is to choose the Smart Goal option in the setup process (detailed above) and save them in the usual way. 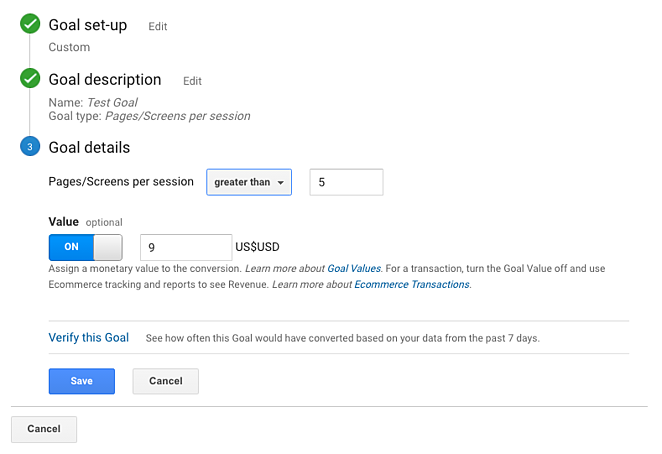 You then need to import these goals into AdWords. To do this, you need to sign in to your AdWords account, select the ‘Tools’ tab, and select ‘Conversions’. Click Analytics in the left-hand menu, and then from the options, check the boxes of those goals you want to import to your AdWords account. Finally, click ‘Continue’. On the following page there will be settings that apply to all of the goals or transactions you selected. Make your selections and click ‘Import Goals’. You can then choose to import more goals, or click ‘Close’. 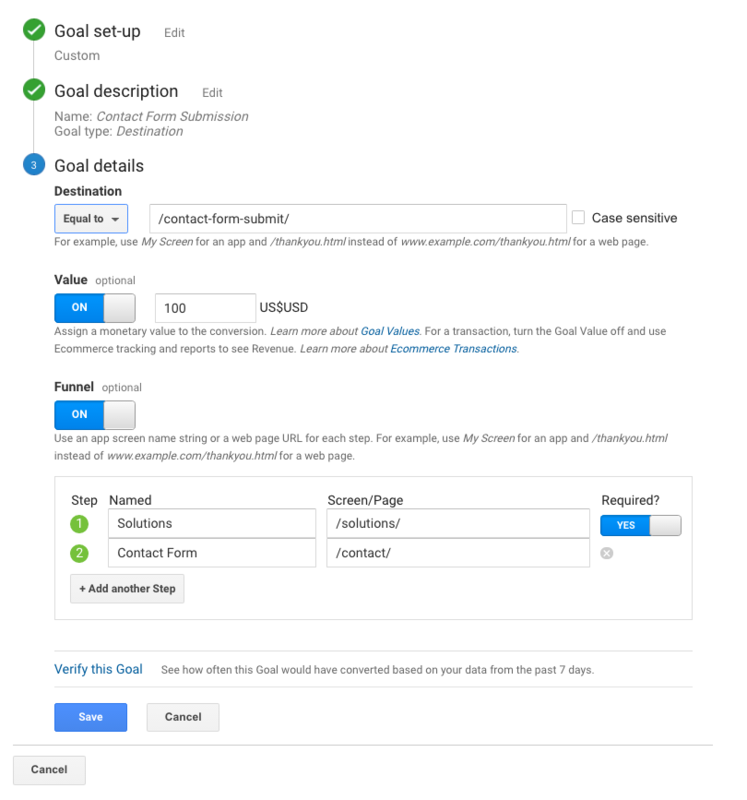 You’ll then want to use these goals to optimise your AdWords account in order to improve its performance. Bear in mind though that these are not user defined goals, and you’re optimising the account based off what Google Analytics thinks are the most important visits to your site, so it’s always better to use pre-defined conversions, such as form submissions. That’s it! A bit of a whistlestop tour, and there’s lots of advanced features you can get to grips with, but this is a good start. In addition to the above, I’d also recommend you review Google’s own guide and Yoast’s post on how to get the most out of your GA goals. Both these posts, and a wealth of other online resources should see you through any implementation. You’ll need to decide the most appropriate goal for your website, but if it’s at all possible, using a destination goal and funnels would be the most appropriate plan of action so you can get the most out of your data. Tracking goals and conversions in Google Analytics is absolutely fundamental to being successful online. Ensuring you have accurate data can influence future decision-making and shape your online strategy. Which mediums are working best? Where should I spend my marketing budget? How can we improve? Only by having goal tracking implemented effectively can you make decisions based on these questions. How can you understand true ROI? Well the next stage is a process called closed-loop marketing or closed-loop analytics - but that’s another blog post on its own. Google Analytics goes hand-in-hand with Google Tag Manager, allowing you to add the web's most popular analytics platform to your website without the need of a developer. Download our free eBook, the Essential Guide to Google Tag Manager by clicking on the banner below. 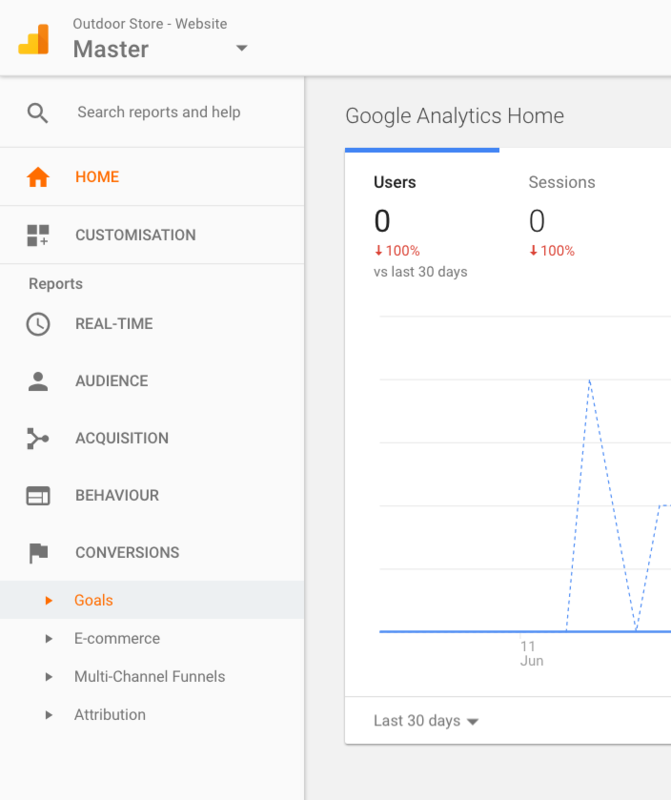 Editor's note: This post was originally published in July 2016, and has been updated to reflect the latest Google Analytics user interface.